"This school is for colored children of both sexes. A school for Africans was commenced by themselves, in 1798, the selectmen first granted permission, and kept in the house of Primus Hall. The yellow fever broke it up, and three years afterwards it was revived by Reverend Doctors Morse of Charlestown, Kirkland of Harvard College, Channing, and Lowell, and Reverend Mr. Emerson of Boston. They provided for its entire support for two years. It was then proposed to have the colored people hire a building, and a carpenter's shop was selected adjoining to the old church [1st Baptist, most likely], and this continued three years. 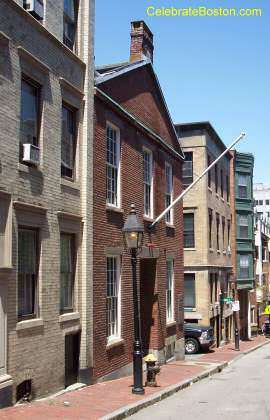 The site of the meeting house was then selected, and purchased by subscription [donations], and the African Baptist Church erected a house, of which the school occupied the basement. The room was completed in 1808, and immediately occupied by the school, and the reverend gentlemen mentioned supported the school, with aid from subscriptions, until 1812, when the town first took notice of it and granted $200 annually. In 1815, Abiel Smith, Esquire, died, and left a legacy of about $5000, the income of which is to be appropriated 'for the free instruction of colored children in reading, writing and arithmetic.' The city then took the school under its entire charge, and in 1833 the ill condition of the [basement school] room attracted attention, and a Committee, of which D.L. Child was Chairman, reported in favor of a new house. The present house was built in the next two years, and on the 10th of February, 1835, the school was named for its benefactor. Its school masters have been, Prince Saunders, James Waldach, John B. Russwarm, William Bascom, Abner Forbes, and the present incumbent since 1836. Latest returns show only 78 pupils; attendance 53."